David Letterman asked Pres. Obama about the debt. First of all, note that the prez does not appear to understand the difference between debt and deficit. Letterman specifically references the overall (accumulated) 'debt,' and Obama immediately mixes that up with the annual surplus/deficit. There has not been an overall surplus since the Andrew Jackson admin in the 19th century. We did have several years of annual surpluses under Pres. Clinton, as Obama says, but we never got close to an overall surplus. Tax foundation report on the growth of 'nonpayers' of federal income tax. This is utter nonsense. For one thing, Obama strongly supported going to Afghanistan from the start, so by including that war he appears to be taking a jab at himself. The war in Iraq, which he did oppose, was about 3% of total federal spending for the nine years that it lasted. Eliminating it as a factor would not have appreciably changed the debt outlook. Secondly, although Pres. Bush did cut tax rates, total tax revenue was relatively flat during the Bush years. Federal revenue was $2.215 trillion in 2001, $2.288 trillion in 2008 (inflation adjusted to 2005 dollars). 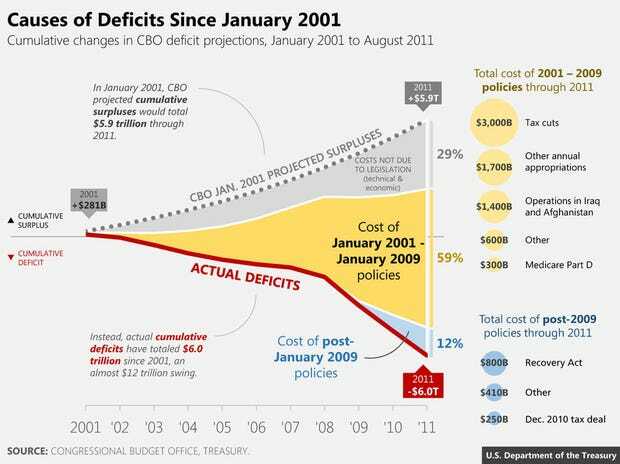 So neither Iraq nor the Bush tax cuts account for much of the debt problem. The problem under Bush was overall spending, just as it has been during the Obama years. Obama is right about one thing--the recession did cause a drop in tax revenue. But he was wrong about almost everything else. No wonder the debt has gotten so bad under his watch. He doesn't have the first clue when it comes to the topic of the national debt. No wonder the national debt ballooned under Obama--he repeats same myths about debt as lefty CD posters. A trend that continues without end. The CBO, factcheck, and the treasury dept disagree with you. Right, Bush cut taxes and then went on a spending spree. This current fiscal woes were predicted back in 2003 by a bunch of economists that said without cuts in spending the tax cuts would burden the US budget. Coupled with the fact that medicare is now paying out more than is taken a deficit was unavoidable. Last edited by Ibginnie; 09-27-2013 at 10:59 AM..
Wasn't this thread pointing out how loony lefty C-D posters parrot BHO? Good on ya, mate. I love how this thread goes from "Oh look at these myths, and the president repeats them!" To full on fact checked data showing that the myths are actually these things called "facts"
David Letterman asked Pres. Obama about the debt. First of all, note that the prez does not appear to understand the difference between debt and deficit. Nowhere in the above video did Obama not understand the difference between debt and deficit. At what time in the above video did Obama show that lack of understanding? Letterman specifically references the overall (accumulated) 'debt,' and Obama immediately mixes that up with the annual surplus/deficit. There has not been an overall surplus since the Andrew Jackson admin in the 19th century. In 1998 we had a surplus of $87.9 billion dollars. In 1999 we had a surplus of $157 billion dollars. In 2000 we had a federal surplus of $290 billion dollars. GW Bush's supply side tax cuts gave the richest 1% of Americans $2.5 trillion dollars in tax cuts. And the unneeded Iraq war caused America to move transport ships, aircraft carriers, tanks, helicopters, and huge numbers of US soldiers to Iraq. Do you honestly believe we can cut taxes by $2.5 trillion dollars, and not create deficits? Do you honestly believe we can move massive amounts of military equipment and soldiers to Iraq, and it does not cost money? The Iraq war is going to cost America around $6 trillion dollars, do you believe $6 trillion dollars is trivial federal spending? GW Bush's tax cuts happened in 2001 and 2003, in those years our revenues fell by more dollars than anytime in American history. The problem under Bush was overall spending, just as it has been during the Obama years. Obama is the smallest government spender since president Eisenhower. Go back to the year 1965 in the above source and notice how spending increases every year. But notice how in the years 2010, 2012, and 2013 government spending goes down. Last edited by chad3; 10-24-2015 at 05:19 PM..
And in 2010, 2012, and 2013 government spending did not just slow down (it went backwards and lowered), that's why Obama is the smallest government spender since president Eisenhower.